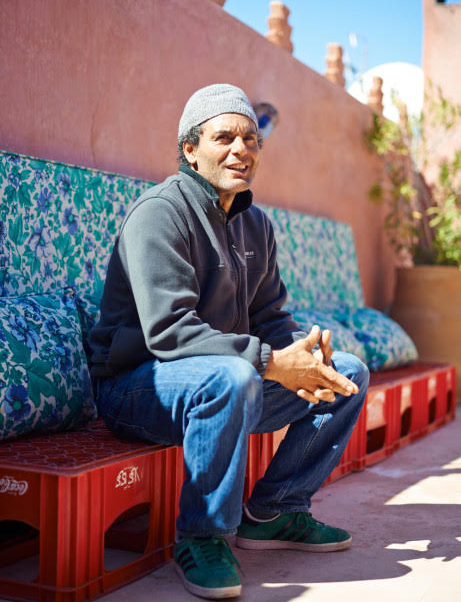 Hassan Hajjaj (born Larache, Morocco in 1961) is a contemporary artist who lives and works between London, UK and Marrakech, Morocco, and is known as the “Andy Warhol of Marrakech. Hajjaj’s work is in the collections of the Brooklyn Museum, New York; the British Museum, London; the Nasher Museum of Art, Duke University, Durham, NC; the Newark Museum, New Jersey; Los Angeles County Museum of Art, Los Angeles; Los Angeles Museum of Contemporary Art, Los Angeles; the Victoria & Albert Museum, London; the Farjam Collection, Dubai; Institut des Cultures d’Islam, Paris; Kamel Lazaar Foundation, Tunisia; and Virginia Museum of Fine Art, Richmond, VA.
Hajjaj was the winner of the 2011 Sovereign Middle East and African Art Prize and was shortlisted for Victoria & Albert Museum’s Jameel Prize in 2009. In 2013, Rose Issa Projects published a monograph of the artist exploring his upbringing in Morocco and London, his experiences in fashion and interior design, and his adventures in the music industry influence the vibrant colours, joyful spirit, and visual rhythm of his highly sought-after images. Hajjaj’s first feature-length film, Karima: A Day in the Life of a Henna Girl, premiered at the Los Angeles County Museum of Art in May 2015. The film takes viewers into the world of one Hajjaj’s most iconic series, Kesh Angels, depicting the henna girls of Marrakesh. Hassan Hajjaj: My Rock Stars was exhibited at the Memphis Brooks Museum in 2016. The film was shown at Art Basel in Basel, Switzerland in June 2015, curated by Cairo-based film curator and lecturer Maxa Zoller.